Ascension with Mother Earth and Current State of Affairs: Secret Space Program Update - Kerry Cassidy Reveals That The UFO Footage Released by the USA Government Is "One of Ours"
Secret Space Program Update - Kerry Cassidy Reveals That The UFO Footage Released by the USA Government Is "One of Ours"
Word I have is that the TicTac sighting of craft plastered all over the news media are actually “ours” meaning belonging to the Secret Space Program run by the U.S. and others. So it looks like they are only revealing OUR TECH in a 13 year old story that they decided to release recently (in Oct-Dec 2017) which then was picked up by nearly all mainstream American media. And yes, we know that they reversed engineered some if not all of the tech to build those craft from ETs.. See my William Tompkins interview for more on this. 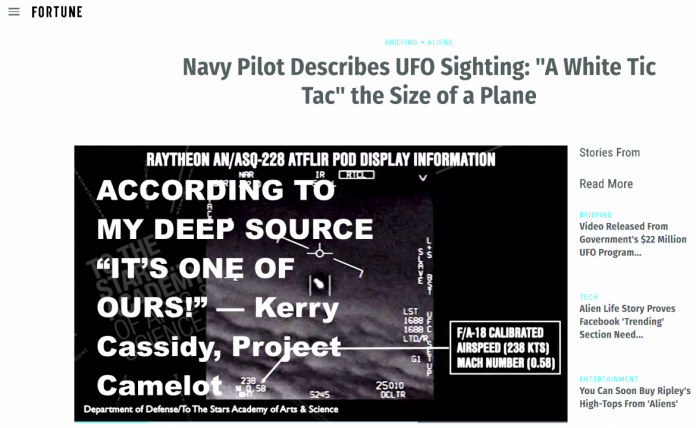 However, DeLonge and Team and specifically Luis Elizondo, FMR Director of Programs to Investigate Unidentified Aerial Threats, USG (CIA) and Chris Mellon, FMR Deputy Asst Secretary of Defense for Intelligence, are misleading the public into thinking that this TicTac sighting is of a “UFO” or for the unenlightened “unidentified flying object” or to use their words “aerial threat”…. This is not true since it is actually built by us (a fleet of such vehicles were actually seen) and instead, (according to my source) it is a disclosure meant as a covert threat aimed to notify the Chinese of what kind of tech we have (dated back 13 years) and a way of owning the DISCLOSURE NARRATIVE! This means that DELONGE AND TEAM are already coming forward with falsified data… You can bet that Steve Justice, FMR Advanced Systems Director for Lockheed Martin’s “Skunk Works” knows damn well whose craft those are and who built them. COME ON GUYS you can do better than this! According to my deep source this latest attempt to bring real disclosure about our SECRET SPACE PROGRAM in operation since the 1930’s is our “SSP” showing off their tech and as such is misleading. If my deep source is correct, and I have full confidence in my source, then these guys (all members of Delonge’s Team) know full well what the craft is and should be ashamed for lying to the American public.